I recently contacted Ashley and asked if she would introduce herself to my lovely readers, and she said YES!!! I'm so excited to kick off this new series with such an amazingly talented lady. Her mission to help inner city highschool students is so amazing and positive, and we need more people in the world like her! My name is Ashley, and I'm an optimistic writer who decided that NOW is the time to accomplish my dreams! I'm obsessed with running (but just injured my knee which is a BUMMER), sushi, my husband (oops, he should have been first :) ), creating, spring, helping others, and discovering new restaurants. The SHINE Project was created to motivate us all to accomplish our goals, while helping others along the way. The Shine Project has spread throughout the world, and has given hope to those who thought they lost it. I created it in the beginning of this year, and its growth has been amazing and unexpected. The new direction of The Shine Project will be revealed within the next week, so come stop by to join The Shine Project team! I also sell SHINE necklaces as a daily reminder of our purpose, and money from each sale goes into The Shine Project Scholarship Fund which will go to an inner city highschool student to help them pay for college. 03. what's a typical day like for you? I usually wake up around 6:30, smooch hubby, and make sure my blog post is ready to go. I graduate college in May, and am currently taking 25 credit hours, work at an inner city highschool, write for a few websites, and build up my blog. I am in charge of a church youth group, and before I injured my knee last week I ran at least 5 miles a day. In my "free" time, I work on my novel that will hopefully be published by the end of this year! I LOVE staying busy! 04. where do you find inspiration? I find my inspiration from every day things. I'll have a random thought as I'm running, or driving, or going to bed, and expound upon it. I really love to watch others, assess their needs, and base what I do on how to help them overcome their problems. Inspiration comes by serving others. 05. who are your favorite artists/designers? I LOVE country music... I'm not picky about designers, I'll only buy designer brands if its on sale at Nordstrom Rack! I'd rather use that money other places! Im the queen of finding good deals. 06. favorite food, city, movie and store? food :: SUSHI, I could eat it every day, all day! city :: San Diego, I was born there, and LOVE the beach! Writing a good piece of work! 08. what is your favorite thing about blogging? the hardest thing? My favorite thing about blogging is seeing the impact that I make on other people's lives. I LOVE getting emails every day from people that I otherwise would not have met, who tell me how I've inspired them. The hardest thing is continuously stretching myself to reach my goals to expand The Shine Project. It has taken a lot of smart decisions in order for my blog to grow as fast as it has in such a short amount of time. 09. can you offer any advice for other first time business owners/bloggers? Go for it. Whatever it is that you want to do, make a plan, and go for it. Growing up, I always told people that I want to be a published author in my 20s, and wanted to be self-employed. People still look at me funny when I tell them. But guess what. I'm on track for making that happen because I don't listen to outside sources that are negative. PEOPLE TELL YOU THAT YOU CAN'T ACCOMPLISH THINGS WHEN THEY ARE UNABLE TO DO IT THEMSELVES. 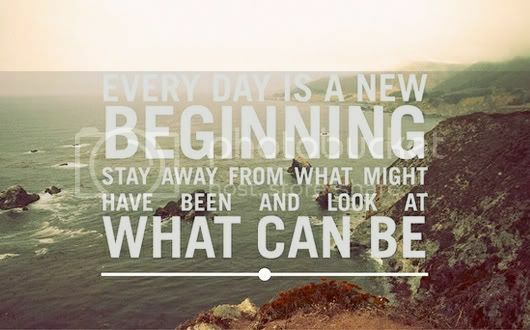 Trust yourself, and be willing to fight every day for your desired end result. 10. what does the future hold for the shine project? You'll see the next step in the next week... which I am REALLY excited about. I want The Shine Project to reach every country, and continue to motivate people to live happier and more accomplished lives. I want to take it off-line soon as well, by creating conferences and books that give in person help. Isn't she awesome? And so inspiring? How can you not love her?! I'm excited to see what the future holds for The Shine Project! 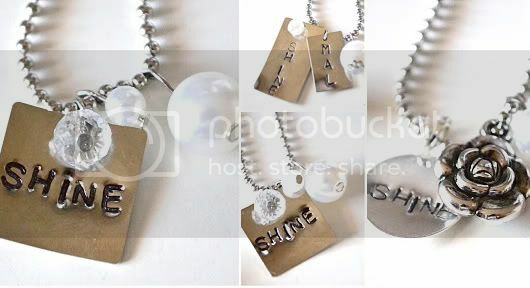 You can get your very own SHINE necklace here (for only $11)!! 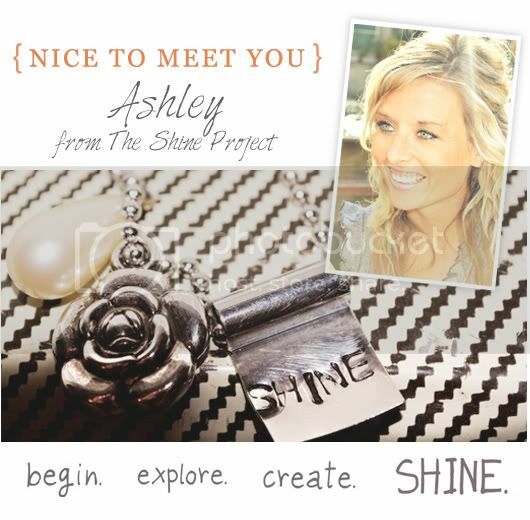 I encourage you all to visit her blog, and to join the SHINE movement!! I Love Ashley! I wrote about her a few weeks ago and wrote about my Shine necklace today! She's a great start to the new series!! Wow she is so inspiring! I will never say "I'm too busy" again! way to kick start this awesome series!!!! Ashley is all kinds of extraordinary! 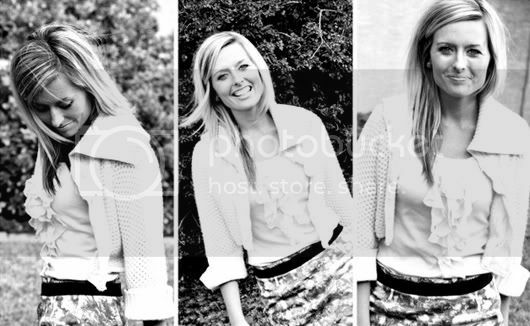 i just adore that girl and her make everyones day kinda smile. I LOVE Ashley and loved learning more about her! I still need to get a Shine Necklace!! Ahhh. She is very inspiring! Thanks for sharing! :-) And cute necklaces!!! 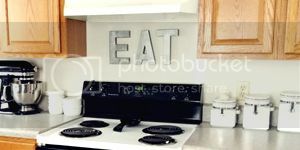 :-) I'm going to check those out! such a fabulous project =) shes super inspiring! we all agree!!! Oww what a lovely goal!